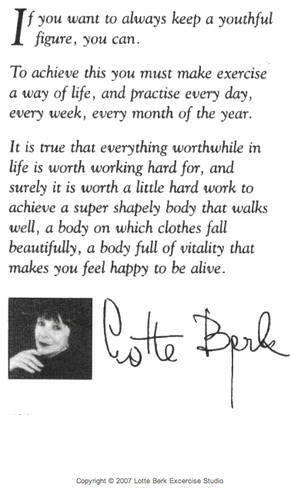 Designed to achieve a lean, supple and toned body, LotteBerk® exercises will help you improve your curves. Created over 60 years ago by the German dancer, Lotte Berk, the moves are based on modern dance, yoga and physiotherapy. "If you want to keep a youthful figure forever, you can"